So let me take just a minute to reminisce fondly about Canyon City. I remember when the inaugural Canyon City race was announced by REVEL back in 2014. I was excited that REVEL had added a California race to their growing series. Instead of having to catch a plane to Salt Lake City for Big Cottonwood (totally worth it, by the way), I could just drive 45 minutes from my home at the time in Burbank over to Azusa. I also was familiar with the area (and the route) and I knew it would be a blast to run down the San Gabriel Mountains. And the race indeed was a fun experience as the half marathoners were bussed pre-dawn way up into the San Gabriel Mountains to a remote rest area for the start. Oh, and the full marathon runners went way way way up into the mountains. Like all of the REVEL races, Canyon City lets you get back to nature with a very scenic route. I truly enjoyed the (mostly) downhill course as we made our winding way down to the city of Azusa, passing the Morris and San Gabriel reservoirs along the way. And once we emerged from the mountains, we were greeted by plenty of local spectators who cheered us on the rest of the way to the finish and some much-needed snacks and really sweet bling. Now the course at Canyon City could surprisingly be a little challenging as the decline for the first half of the full marathon course was much much steeper (4000′ net decline) than the second half (1000′ net decline). The latter half even had a few short stretches where the course actually gained some altitude. And when you’ve been running downhill for a few hours straight, even the slightest incline can feel like a slog (it’s an instance where you can actually make a mountain out of a molehill). Now, I was running the half marathon course so my legs weren’t nearly as fatigued when I hit the short upgrades, but I was still happy when I crested each incline and started going downhill again. But as a whole, a nice and scenic trip down the mountain. Now, about my soft spot for Canyon City. Back in 2014 I “brought the crazy” as I ran 3 different half marathons in less than 33 hours (and in two different states). The first leg in that weekend of racing insanity was the inaugural running of Canyon City. I ran the race extra slow (in order to save some energy for the other two races) and really got to take in the sights and also let my mind wander about what the rest of the weekend had in store. It was a blast and something that will forever put a smile on my face. Farewell Canyon City… and thanks. And now Canyon City is no more. REVEL hasn’t canceled its California race so much as it has relocated it. And change can be good. I remember back in 2010 the LA Marathon completely changed its route and now I can’t imagine running anything other than the stadium to the sea course. 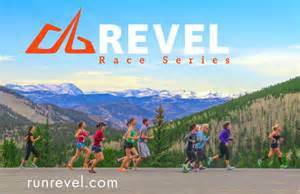 Starting in 2018, the REVEL Canyon City race will be replaced with the REVEL Big Bear Marathon/Half Marathon. If you’ve never been to Big Bear, it’s a beautiful community and a great getaway from LA’s hustle and bustle. Runners will get to head down the course set in the beautiful San Bernadino National Forrest ending up in the town of Redlands. The REVEL Big Bear Marathon has a net decline of over 5000′ while the half marathon course drops over 3000′. And like all of the other REVEL races, Big Bear is a Boston Qualifier. You can check out all info on the REVEL Big Bear Marathon/Half Marathon here. So while I bid Canyon City a fond farewell, I do also get to give a hearty howdy to Big Bear. But this past weekend I paid a little tribute to Canyon City as I donned my old orange and grey 2014 race shirt for my long run. And I had a little extra pep in my step. Good memories will do that. Think happy thoughts… and Run on! Any retired races (or courses) that you miss? Posted on May 29, 2018, in General. Bookmark the permalink. 2 Comments. Thanks to the awesome Revel race series, they are honoring the Revel legacy for CC at BB! So cool! Just another thing to dig about REVEL. I’m trying to figure out which REVEL race I’ll do this year (a bit harder being on the east coast because every one is now a plane flight). Big Bear will be awesome but doesn’t fit my schedule this year. I’ll probably do Big Cottonwood because that’s my favorite race period, but Mt. Hood might be doable if I hang out on the West Coast following Comic Con. Bummed I missed Mt. Charleston this year (work conflict) but am planning for 2019. Which ones are you doing?